Ken Griffey Sr. came to bat in the first inning with a runner on base and no outs. He sent a Kirk McCaskill pitch over the fence in left-center field for his third home run of the season. There to greet him at home plate was the on-deck batter, Ken Griffey Jr. "That's how it's done, son," Senior said. Junior stepped to the plate and hit a ball to almost the exact same spot in left-center at Anaheim Stadium for his 20th homer of the season, and the Griffeys became the first father-son tandem in Major League history to hit back-to-back home runs. 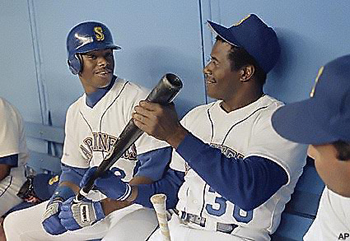 To this day, they are the only father and son to hit a home run in the same game, let alone go back-to-back.